The aromas of citrus fruits contained in perfumes are popular especially in summer, because as we associate with tropics and hot weather. Thanks to them, even for a moment we can move to warm countries. They give us energy and refreshment, and even improve our mood. In perfumery, the concept of citrus notes contains a whole range of scents from so-called hesperid fruit. Their name comes from Greek mythology, where the Hesperydami were called the nymphs of the Sunset, being the guardians of the garden of the gods, in which the apple-tree was born, which gave birth to golden apples. In the group of citrus scents, however, we find not only fruit. These fragrance notes also include plant flavors, for example vervain or lemon grass. Citrus is one of the oldest fragrances used in perfumery. 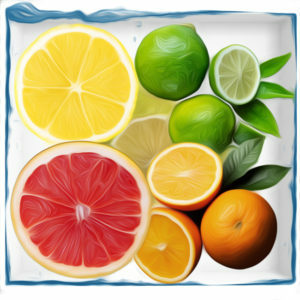 Citrus aromas give the perfumes freshness, stimulate us, bring joy and optimism. They blend well with floral and oriental notes and break the sweetness of perfumes very well and add a bit of astringency. They are most often used in the upper notes – head notes.